The affinity laws apply to pumps as they do to fans. To understand frequency converter applications applied to pumps, it is a good idea to review the basics of how pumps are applied in general. Figure 1 shows a pump curve relative to a hydronic system curve. 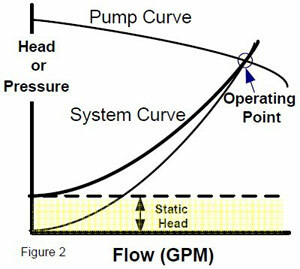 The pump curve describes the head (or pressure) versus flow characteristics of a particular pump. The curve shows that the pump will produce limited flow , at point B, if it is applied to a system with a large differential pressure required to lift the water/glycol and overcome resistance to flow. Larger flow rates are achieved with this pump if pressure differential is reduced- as at point A. 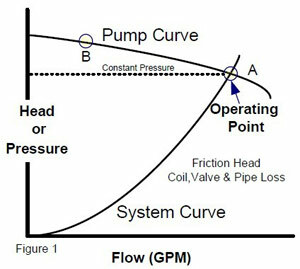 To determine where along the pump curve the pump will operate requires information provided by the system curve. The system curve show the characteristics of the piping system. It shows the friction head as it increases with flow. Friction head is the measure of resistance to flow provided by the pipe, valves, elbows and other system components. The head required at zero flow is a called static head or lift. Figure 2 shows the combined friction and static head curve for the system. The static head is the amount of feet of elevation the pump must lift the water regardless of flow. Another way to look at is as the work needed to overcome gravity. 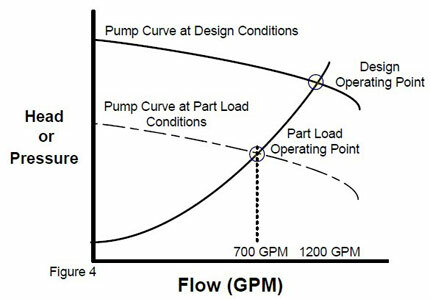 The intersection of the pump and system curves shows the natural or design operating point for the system. At this point pump pressure matches system losses. The intersection would generally be chosen to ensure that the pump is operating at or near its best efficiency. Most hydronic systems do not always work at design conditions. Systems with 2-way control valves vary the flow by modulating the valve to various positions. Closing the valve reduces flow and increases system friction in the system. Figure 3 shows a typical operating point when a particular flow is achieved by the control valve. Notice that the flow is achieved but at a increased system pressure. Applying a frequency converter to a pump to reduce speed and therefore flow, causes the pump curve to shift down as shown in figure 4. 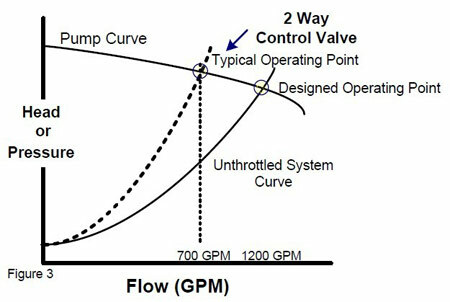 Since the operating point is still the new reduced pump curve and the system curve, the same reduced flow (note 700 GPM from 1200 GPM in figures) is achieved as with a valve. This flow is achieved but at a reduced pressure. Operating at reduced pressures can result in longer pump seal life, reduced impeller wear and less system vibration and noise. Due to the affinity laws, power is greatly reduced at reduced flows thus offering significant savings by frequency converter. BYPASS: If bypass control is used (example: 3-way valve at coils ) the frequency converter system is always at constant pressure. (See CP in Figure 6). The savings potential can be quite large if there is no modulation present when frequency converters are retrofitted. 2-Way VALVE CONTROL: If 2-way valves are used, the system operates along the pump curve from Operating Point to P3. These systems use less energy than constant pressure systems. If a frequency converter is being applied, the system will operate along the system curve from Operating Point to V3. Static Head can affect possible energy savings. If static head is high, the system curve can approach constant pressure. For example, in Figure 7, a pump curve is shown with three system curves  one with no static head, and two others different static heads. For a given flow rate, the difference between points A and B represent possible energy savings. Basically, the lower the static head, the greater the energy savings that can be achieved with frequency converters. Plot these two points on a copy of the pump curve. This application states energy saving reconstruction on ID fan and FD fan of 4# boiler in a Chinese Oil Industry Company, introduces reconstruction purpose, scheme, implementation and principle. It analyses reconstruction effect, especially the economy effect, illustrates meaning of reconstruction. Variable frequency adjustment is an effective way of source saving management. The plant has three 75t boilers, three 220t boilers. 1#, 2# and 3# boilers are 75t. 4#, 5#, and 6# boilers are 220t. Six boilers all equip ID fan, FD fan and SA fan. The motors of fans are designed as per max load. But boilers run in max load in very short time and they run at 66% load mostly. So actual air flow of boiler demand is not max flow but variable flow which varies with load changing. In order to meet air flow requirement, we use conventional damper adjustment. This way can change air flow but cannot change motor speed as well as save energy, causing much energy waste and cost rising. In order to lower production cost and power consumption, variable frequency technology should be adopted. By utilizing low voltage frequency inverter, the plant has gained considerable energy saving effect and maintenance experience. With maturity of medium voltage frequency inverter, we utilize this technology outcome to medium voltage motor. We reformed for three fans of 4# boiler in May, 2006. 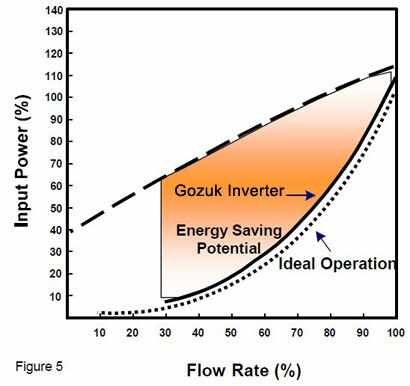 After comparing and analyzing, the plant selected Gozuk frequency inverter eventually. We decided to adopt “one drive one” scheme due to importance of fan. That is, one frequency inverter drives one motor of fan. In order to improve reliability and safety, we add bypass circuit. Please see the figure. QF is vacuum breaker. QS1, QS2 and QS3 are medium voltage isolator. Medium voltage frequency inverter is between QS1 and QS2. QS3 is bypass switch. 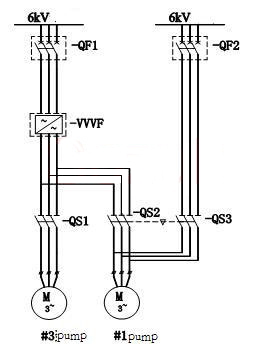 When motor needs to run in variable frequency, open QS3 and close QS1, QS2, then close QF. When motor needs to run in direct on line, open QS1, QS2, close QS3 and then close QF. In this way, motor can run in direct on line during frequency inverter downtime or maintenance. Above scheme is typical manual scheme. QS2 and QS3 interlock in mechanism and they cannot close simultaneously. In order to realize fault frequency inverter protection, frequency inverter sends trip command when it faults seriously and link trips medium voltage breaker to make frequency inverter off power. In the meantime, three switches interlock electrically with QF. Only when breaker is off, can personnel operate switch, which ensures safety. According to actual state, we adopt three control schemes. They are DCS close loop control, DCS open loop control and local control. Principle of frequency inverter is to rectify AC to DC and invert DC to AC. During this course, electric components emit heat (2%). The heat causes equipment temperature up and damages equipment. In order to ensure stable work of frequency inverter, the heat must be dissipated outside. So cooling scheme is very important. After researching carefully, we adopt the most effective and easiest scheme—air cooling. Install air duct on top of frequency inverter. The duct discharges the heat outside. The scheme only needs a duct without other device, so it is simple and reliable with few failure factor. Make full load test at 40℃. Max temperature of frequency inverter reaches to 68℃. Compared with max design temperature-rising, the result is ideal. After reconstruction, damper opening is 100%, which reduces resistance loss a lot. Because motor runs in variable frequency, fixed resonance frequency is difficult to be line with operation frequency, thereby resonance can be avoided. So problem of pipeline breakage is solved naturally. This is also an unexpected benefit. If motor starts in direct on line, start current is 7~8 times of rated current. Big current increases electrical force and creates heat, which shortens motor lifetime. In variable frequency system, motor realizes soft start. Motor can start at zero speed and accelerates to operation current gradually. Frequency inverter drives load in V/f control or vector control without impact on power grid. After reconstruction, motor usually runs in 30Hz~40Hz. Compared with line frequency 50Hz, fan speed lowers. In addition, slow accelerating prolongs equipment lifetime. Damper lifetime is also prolonged. Maintenance labour reduces and maintenance cost reduces too. Note: power factor is 0.85 before reconstruction and 0.97 after reconstruction. From above data, during operation from 140t to 200t, we see energy saved reduces with load increasing and increases with load decreasing. Boiler works in 140t~150t for about 8 months, in 200t just for 2 months, in 180t for 1 month, maintenance for 1 month. Power consumption of three fans of 4# boiler is about 18631338.7kWh before reconstruction and 9411516.9kWh after reconstruction. Yearly power saved is 9219821.9 kWh, energy saving rate is 49.5%. that is to say, we can approach production task by 50.5% of power consumption before. Power price is 0.45yuan/kWh, yearly cost saved is 4148919.8yuan (USD610135). The investment is recovered within the year. The reconstruction of 4# boiler was an important project in 2006. The project is specific measure of transferring from extensive management to saving management, is a great stride on energy saving. Technics effect and energy saving effect inspire positivity of staff. In the meantime, it indicates enormous potential of energy saving. Disk type machine has violent mutations inside, which brings serious impact to the machine and decrease the life of the whole system. In most of the shoes manufacturers in China, old equipment, low automatization and high energy consumption is the main problems. The equipments are usually designed as the biggest production capacity, while it’s rarely used in this situation. The motor of the oil pump keeps the steady speed, so the output power will hardly change. This is a serious energy-wasting. Veikong frequency inverter can test the pressure and flow signals from the disk type machine and track and control the output power, pressure and flow. This is equivalent to changing the fixed pump into energy-saving pump, the previous system is fit for the whole machine’s demand power. Veikong inverter can achieve energy-saving purpose and also reduce the vibration of opening and closing the mold largely, which can keep the products’ quality stable, reduce the defective problem and prolong the machine’s life. Proved by the practice, through this new energy-saving technology and its serial managing operation, the enterprise can at least reduce 20%~70% cost. Veikong frequency inverter application in the plastic machines is widely used and popularized. This technology has made great contribution to the energy-saving in China. Most of the injection molding machines in the market are using hydraulically driver. The power in the injection molding system is supplied by the machine’s driving the oil pump. The machine needs different flow and pressure in different working procedure and the loading changes a lot. Besides, the output power of the constant pump is irregulative. Hence the extra energy is consumed in the damper, divulging of the oil circuit, the heating of the oil, which aggravates the wearing among the valves, as well as the over-heating oil circuit, over-noisy of the machine. Besides, the energy wasting is very common in this field. So it will be very significant in energy-saving to popularize the frequency conversion technology. The usually procedure of injection mould is below: locking mode—-keeping pressure by injection—-melting the glue and fuelling it—-cooling pitching—-opening mould and thimble. Every step has the wonderful coordination of time, pressure, speed and position, which means every displacement has the corresponding pressure and speed and the pressure and speed are changeable in different position and time. Meanwhile, each time when finishing one step, the terminal signals will be sent to the program controller and the controller will send out the order for the next step. The traditional injection molding machine uses constant pump supplying oil. Hence different steps need different speed and pressure during the procedure. The motor keeps one speed during the whole course, so the fuel supply quantity is fixed. The operation is intermittent, so it can’t be always full-loaded. Thus there is a lot of energy wasted in the traditional fixed oil-supplying quantity system. It is measured at least 50% is wasted. Energy-saving frequency inverter drive detects the proportional pressure and proportional flow signals from the injection molding control system and adjust the motor speed needed by each step timely (flow regulation), which makes the flow and pressure of pump just fit for the system’s need. While in off-working status (mainly cooled status), stopping the motor will save more energy. Concluded speaking, the regulating-frequency technology can bring great energy-saving effect to the machine. Reducing the noise, improving the working environment. Production needs gas is 0.76MPa, there is a remote pressure sensor in equipment, which can bring 4-20mA current signal to the inverter, so that the whole system under PID closed-loop control. When the pressure reaches the set limit, the compressor starts unloaded, while the frequency inverter allows the air compressor to run the following limits; when the pressure drops below the set frequency of a certain value, the air compressor starts to load, but the drive to Air machine accelerates to maximum frequency operation. It’s not only quickly and efficiently to meet production needs, but also to maximize energy savings, but also can extend the life of the air compressor. Frequency inverter reconstruction of Power Plant promoted heightening of economy benefit. Frequency inverter won acceptance of user as its high reliability, flexible adjustment and simple operation. A Power Plant was set up in June, 2000. Its predecessor was one of key plants of state. The plant put into service in 1957. Now it has 4×50MW, 2×142MW, total ten boilers and six generators. Total capacity is 484MW. The plant supplies power to big enterprise near to it. In the power plant, for main equipments, such as FD fan, ID fan, feed pump and circulating pump, output power cannot change with load variety. Damper control or valve control causes much energy waste. Therefore, energy saving and emission reduction are brought up on the agenda. Power plant is in search of way of energy saving in term of technology. Making technology reconstruction for main equipment by medium voltage variable frequency technology is an effective method of energy saving. During reconstruction of ventilation cooling tower of circulating water system in 2001, power plant reduced circulating water flow to 5000t/h from 10000t/h, which lowered cost of power generating, and gained evident economy benefit. But there was a problem. Four sets of axis flow recycle pump (rated output 9720m3/h) were equipped for inlet of tower specially. Output of pump was too big, which could not match with water tower. As is well known, performance curve of axis pump is very steep. Pipe resistance variety affects little on flow variety. Outlet gate of the pump and inlet gate of well can not be throttled, which leads to difficult adjustment of flow. Thus flow adjustment only depends on adjusting condenser outlet gate, starting/stopping circulating pump and increasing/decreasing primary water flow. That is not convenient at all. Furthermore, it is wasteful. For example, in winter, temperatures of circulating water inlet and outlet are low. If a recycle pump runs in rated condition, in order to ensure pump inlet normal, output gates of all machines open big. In the meantime, in order to maintain main pipe pressure, circulating pump needs to starts, which increases power consumption. In summer, because of high temperature of coming water, primary water flow increases to ensure temperature of air discharge not too high. Condenser opening is also big, causing #3, 4 water level flooding. Starting recycle pump would oblige condenser outlet gate big opening. All eight circulating pumps starting can not ensure #3, 4 water level. Furthermore, starting circulating pump and increasing primary flow lead to cost rising. Install frequency inverter on #1, 3 recycle pump according to actual state and strategy of sustainable develoment. 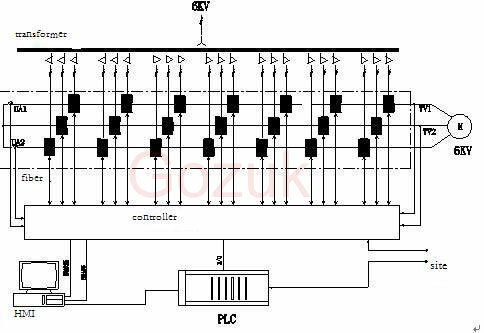 After comparisons and researches, power plant selected Gozuk frequency inverter at last. #1 and #3 recycle pump involve in following circulating course: draw water of storage tank to cold water tower. Water of tower is used for production. Residual water returns to storage tank. Install frequency inverter ahead of motor to boost adjustment. frequency inverter adopts new model power cell. It implements digital computer control by power cell and programme control. frequency inverter has advantages of high reliability and simple operation, applicable to power plant. Originally, one pump drew less water, causing water flooding, about 5000m3/h. After using frequency inverter, two pumps work at 35Hz together, maintaining water level at 4.8m. No water flooding caused. In addition, frequency inverter also accelerates circulating course, lowers coal consumption. Frequency inverter reconstruction reduces times of pump start/stop, keeps system reliable, lowers adjustment difficulty. Frequency inverter improves adjustment flexibility. It is convenient for cleaning glue ball of condenser. Originally, this work demanded primary water. During the course, increasing/decreasing primary water, starting/stopping circulating pump lead to circulating water waste. Variable frequency pump meets water level demand by adjusting motor frequency. In summer, starting variable frequency pump can increase inlet water, heighten cooling efficiency of tower, which avoids flooding, increases circulating rate of cooling water, lowers air discharge temperature, improves thermal economic. In winter, when water temperature is low, just starting one variable frequency pump can ensure reliable temperature of air discharge, heighten system safety, decrease primary water and power consumption, which lowers cost and enhances benefit. Frequency inverter has been running stably since it put into service in September, 2003. Controllability of circulating system heightens greatly. Frequency inverter not only saves much power but also lowers primary water, reduces times of pump start/stop. It also improves vacuum, decreases coal consumption. Thereby, this project got second prize of science & technology achievement and first prize of Power Plant science & technology development. As a new speed adjustment mode, medium voltage frequency inverter has advantages over other speed adjustment modes. It is main control method of energy saving in big power plant. Frequency inverter reconstruction promotes economy benefit and wins user acceptance as its high reliability and flexible adjustment. First, add water, washing operations for minutes, wash finished, drainage, entered the stage of dehydration, dehydration stage includes uniform, at medium and high three process, uniform is in water and without water, than high speed positive rotation of 1.5 minutes, washing the clothes evenly attached on the inside of the drum of the washing machine, so that the subsequent dehydration process smoothly; After drainage, improve speed into medium-speed dehydration process (2 minutes), then in the process of high-speed dehydration (5 minutes), makes the moisture content of clothes down to the required level. High-speed dehydration: 700 ~ 800 RPM. DC excitation can improve the electric motor torque response, ensure the motor output torque quickly, fast the speed of response. The inverter adopts magnetic flux vector control technology, and huge advantage by high speed motor control DSP chip for the complex control algorithm ensure the stable operation of high torque in low frequency. 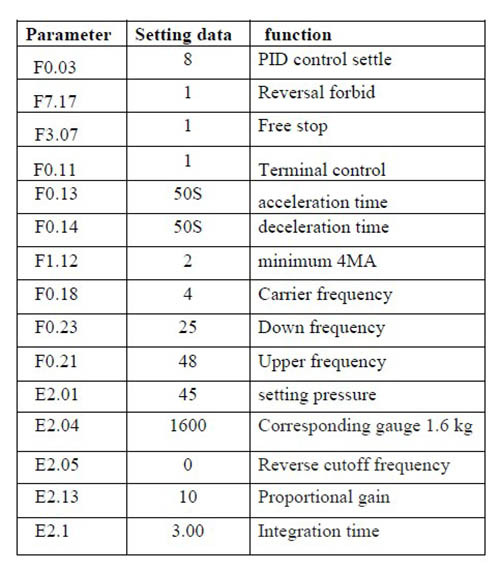 Accurately self-tuning motor parameters and correction on-line to carry out a static motor parameters self-tuning and dynamic motor parameters self-tuning, which is convenient for users. The frequency inverter can automatically store multiple sets of motor parameters through self-learning, by switching instruction to achieve high performance vector control of the different motor which is easy to motor drive system control, and improved the competitiveness of the users. The safe and reliable brake control can make the electrical braking to match the mechanical braking which form a safe and reliable protection lock to ensure that the system is safe and reliable. In a double lifting structure, master-slave control speed synchronization function ensures that two lifting mechanism of synchronous lifting and safety. In two large power motor through the gearbox rigid driving a hoisting mechanism, the master using speed control and the slave adopts torque control to realize power and torque balance. The inverter support PROFIBUS-DP, MODBUS and variety of different communication mode with international standards communication protocol compatible various control requirements and can achieve communication between a number of frequency inverters and PLC.